Shoestring Elegance: Beat The Winter Cold With My Roasted Butternut Squash Soup! 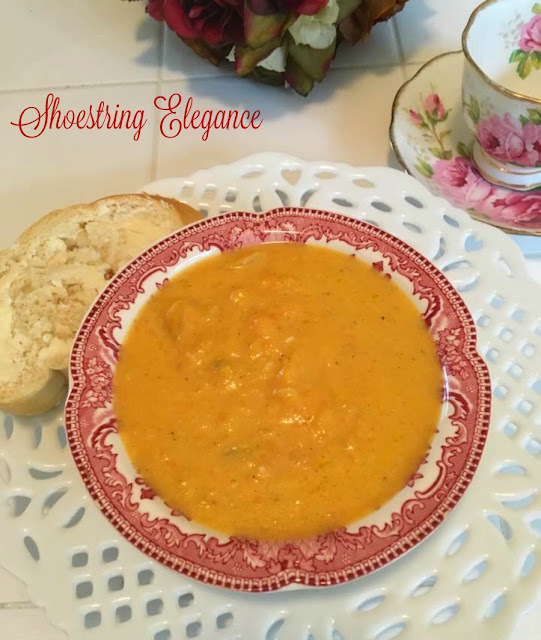 Beat The Winter Cold With My Roasted Butternut Squash Soup! Welcome, all! It has been below freezing here in Northern California, which has me baking and cooking a lot. If not for the food, for the warmth it provides in the home! This was actually a recipe I emailed to a dear friend, she loves it so much, as do I, I wanted to share it with you!! If you are a regular to my Blog you already know I don't "do" recipes the way most people do, I explain them. Once again, I can't say this enough, the "way" you make something is as important as the ingredients you use! I hope you enjoy it! 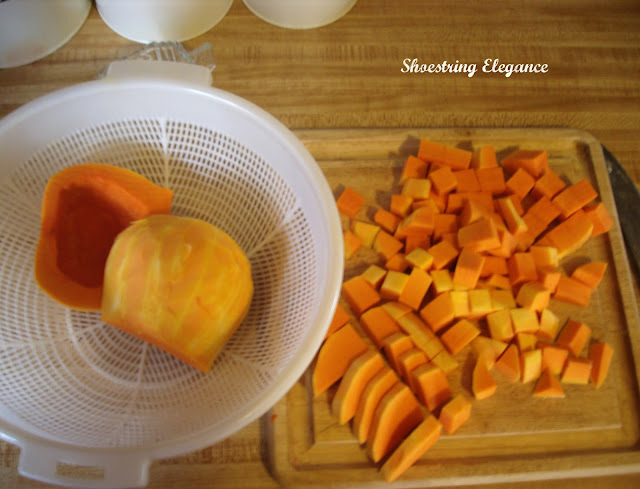 Now you are ready to place your cut pieces in a bowl (make sure you have room to toss the butternut well) Then sprinkle with 1 Tbsp. of salt and 1 Tbsp. of white sugar over the top of the butternut. add 1- 1-1/2 tbsp of extra virgin light olive oil and microwave 20 seconds so the butter melts, swirl together so your butter and oil combined. Slowly pour oil mixture over the top of your cut butternut. 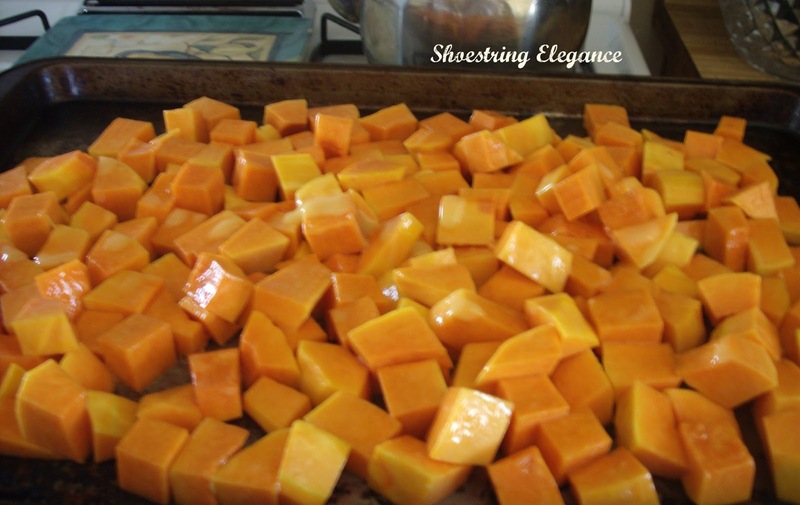 Take a spatula and fold the butternut with the oil until coated and shiny. Pour onto a cookie sheet and smooth out to an even layer. Cover with foil. Press foil down over your butternut mixture, don’t wrap over edges and seal off, you do not want to steam it. 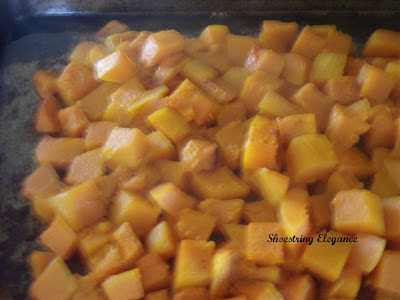 Bake in the oven covered at 450F for 15-25 minutes, check to see that your butternut is fork tender when it is, give it a good turn with your spatula and place back in the oven for another 5- 10 minutes to caramelize, just long enough to see some browning on the edges. Yummm!! These are the sweetest little morsels you'll ever taste! Good luck keeping enough to make your soup! I have actually had to bake a second squash. Remove and set on a side burner. Lightly salt your vegetables, and saute (covered) on medium-low heat until onions are transparent, add 1 can of Swanson’s chicken broth. Add puree back to remaining soup. If you like you can puree all of your soup, I have found that is nice to have a little texture to your soup. DO NOT BOIL AFTER YOU HAVE ADDED THE MILK. If you do, you may see some separation of the milk. 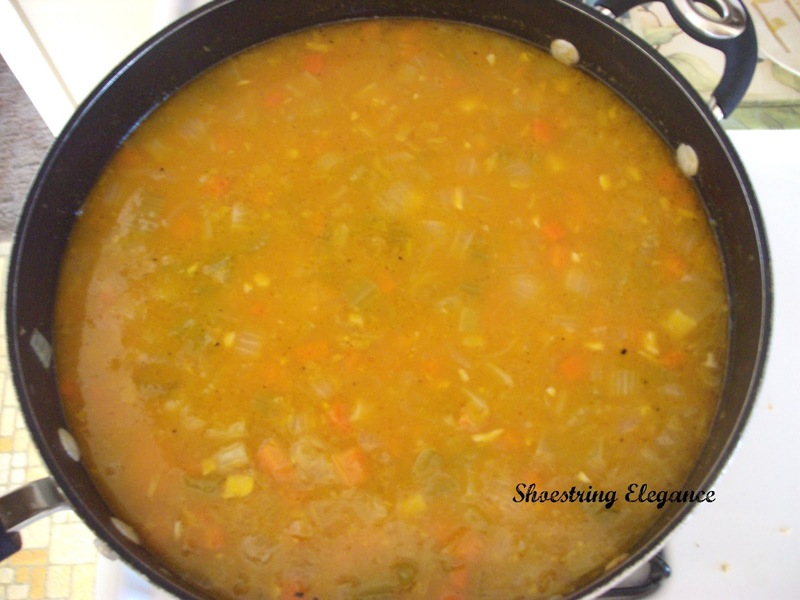 You can serve now and for leftovers reheat on low heat and stir frequently just until desired heat. That’s it!! I hope you enjoy. This one has certainly been a hit in my house and definitely guaranteed to warm you up. Store leftovers in the refrigerator. God Bless! Will try it this week. Oh Good, Sandy!! I'm so glad! Please come back and tell me how you liked it. This looks like just the ticket for a cold winter supper. Thanks for sharing! Thank you, Ladies !! i do hope you enjoy it! My family has been after me to Blog this recipe for some time now. It's one of our "family favorites" I hope it will become one of yours, too. 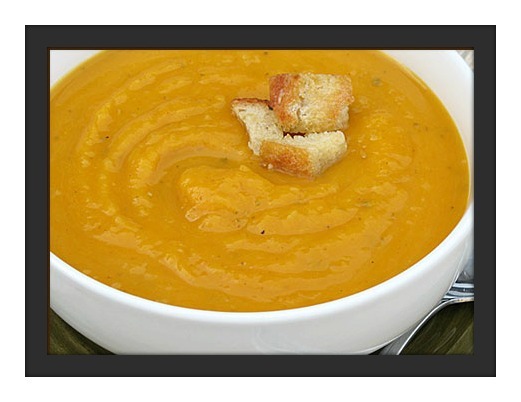 Butternut squash is one of my favorite soups! 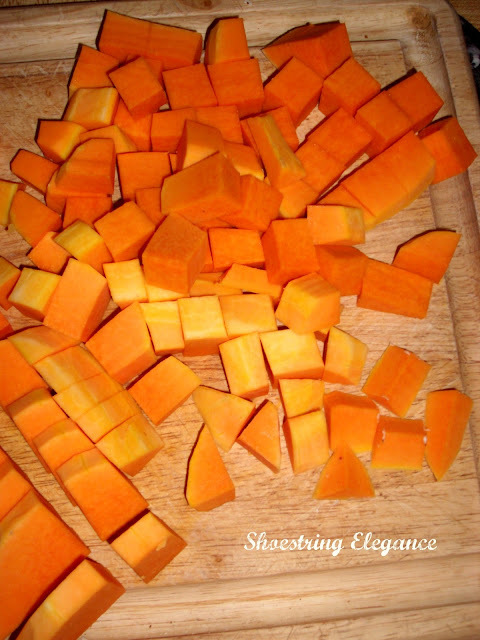 I love butternut squash, one of my favorites! Thanks for sharing this wonderful recipe at Simple & Sweet Fridays. This looks so delicious! I'm pinning this recipe--thank you for sharing it! 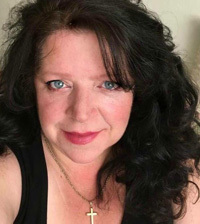 Why don't you pop on over to the cottage and link up your delish-sounding dish to my Time Travel Thursday linky party. Thanks, Theresa!! I think you will really enjoy it!! I hope you do give it a try! I appreciate the invitation to your lovely party!! Thanks for linking up with me today! I just had to pop over and see what you linked up! I pinned this for later so I can make it! It looks so good!! Hi, Amber.. I'm sorry it's taken me so long to reply.. But, I hope you've made the soup and enjoyed it! Thanks so much for your kind comment. This makes me want some right now.. YUM.